Reviews from Sundance of two coming-of-age movies competing in the US Dramatic Category. A report on four movies from Montreal's Fantasia Festival. A tribute to the legendary Michael Cimino. Roger's Favorites: actress Faye Dunaway. An appreciation of "1941" and interview with Bob Gale. 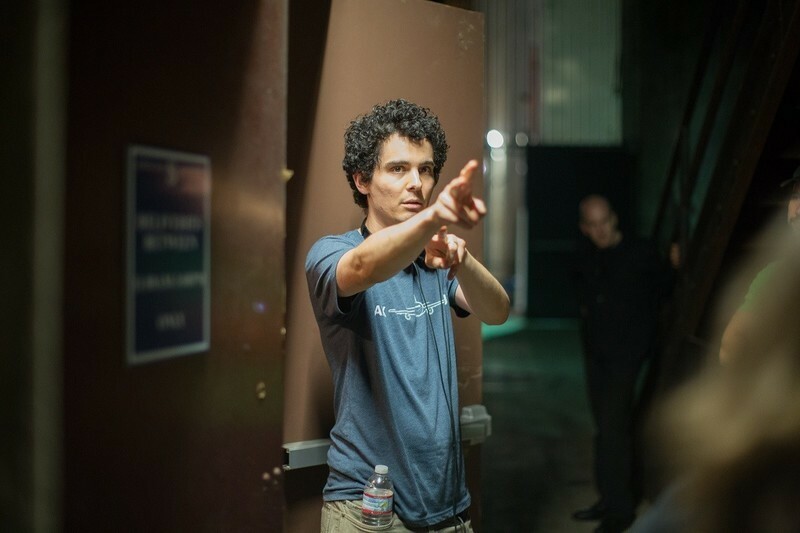 An interview with Damien Chazelle, writer/director of "Whiplash". Catching up with Treat Williams and William Forsythe on the NYFF screening of and Blu-ray release of "Once Upon a Time in America." Abel Ferrara's thinly veiled take on Dominique Strauss-Kahn screened off-fest. Marie writes: Roger recently did an email Q&A with the National Post's Mark Medley, which you can read here: "Roger Ebert's voice has never been louder". And in a nice touch, they didn't use a traditional head-shot photo with the article. Instead they went old school and actually hired an illustrator. Yup. They drew the Grand Poobah instead! And here it is...pretty good, eh? "I realize that most of the turning points in my career were brought about by others. My life has largely happened to me without any conscious plan. I was an indifferent student except at subjects that interested me, and those I followed beyond the classroom, stealing time from others I should have been studying. I was no good at math beyond algebra. I flunked French four times in college. I had no patience for memorization, but I could easily remember words I responded to. In college a chart of my grades resembled a mountain range. My first real newspaper job came when my best friend's father hired me to cover high school sports for the local daily. In college a friend told me I must join him in publishing an alternative weekly and then left it in my hands. That led to the Daily Illini, and that in turn led to the Chicago Sun-Times, where I have worked ever since 1966. I became the movie critic six months later through no premeditation, when the job was offered to me out of a clear blue sky. "Visit "I was born inside the movie of my life" to read the opening pages from Roger's forthcoming memoir to be published September 13, 2011. Would you like to see my tattoos? Is it love at first sight? It's certainly lust at first sight between them in the beginning. Something clicks inside. They soon begin their secret affair, and then, motivated by their common desire to escape from the world they're stuck in, they hatch a scheme to solve their problems once for all. They have a good plan. They can succeed if they carefully tiptoe along the thin line they draw. However, in the world of film noir, it is usually easier said than done. Marie writes: Doug Foster is a filmmaker and artist who produces large scale digital film installations that often play with ideas of symmetry and optical illusion. His piece The Heretics' Gate is currently on view at "Daydreaming with... St. Michael's" - an exhibition taking place at St. Michael's church in Camden, London. Note: Foster's piece first appeared at the Hell's Half Acre exhibition at the Old Vic Tunnels in London in 2010. "The Heretics' Gate" draws inspiration from Dante's Inferno, the first part of his epic poem The Divine Comedy. A twenty foot high, arched screen and a thirty foot long reflecting pool, are cleverly combined to deliver a mesmerizing and strangely ethereal vision of hell at the central focus point of the church's imposing gothic architecture. To learn more, visit: Liquid Hell: A Q&A With Doug Foster.NOTE: The exhibition is the latest installment in renowned British music producer James Lavelle's curatorial and collaborative art venture, "DAYDREAMING WITH..." - a unique and visceral new exhibition experience, inspired by the desire to marry music and visual art. The goal is to bring together some of the most acclaimed creative names working in music, art, film, fashion and design. In the biochemistry class during my naive undergraduate years, the professor jokingly said the capability of metabolizing alcohol depends on our genetic makeup. Thanks to the variations in the genes, some people can produce more enzymes or more active enzymes to take care of alcohol in their body. They can be heavy drinkers, or the ones less susceptible to the hazards caused by alcoholism than their fellow drunks. That may explain the existence of Charles Bukowski (1920-1994), the "laureate of American lowlifes" who lived a relatively long life despite many days and nights of bottles and women at the bars. As Stephen King says in his insightful book "On Writing," writing usually has no business with drinking ("Hemingway and Fitzgerald didn't drink because they were creative, alienated, or morally weak. They drank because it's what alkies are wired up to do."). Sometime there are exceptions like Bukowski. Drinking and writing always came together to him, and he had no problem with that. Marie writes: Yarn Bombing. Yarn Storming. Guerilla Knitting. It has many names and all describe a type of graffiti or street art that employs colorful displays of knitted or crocheted cloth rather than paint or chalk. And while yarn installations may last for years, they are considered non-permanent, and unlike graffiti, can be easily removed if necessary. Yarn storming began in the U.S., but it has since spread worldwide. Note: special thanks go to Siri Arnet for telling me about this cool urban movement. CHAMPAIGN-URBANA -- Michael Tolkin, the writer-director of 1994's "The New Age," which played at Ebertfest on Thursday, surveyed the packed house from the stage of Champaign's historic Virginia Theater and said, "This now doubles the number of people who saw this film on its first release." Charlie Kaufman, the writer and director of "Synecdoche, New York" (2008), my choice for the best film of the decade, will appear after the screening of his masterpiece at Ebertfest 2010. The 12th annual festival will be held April 21-25 at the landmark 1,600-seat Virginia Theater in Champaign-Urbana, and for the first time ever, all festival Q&A sessions and panel discussions will be streamed live on the Internet. With a perfect score, George E. Barletta is the top prize winner of a trip for two to the world premiere of Pixar's "Up" at Disney's El Capitan Theater on Hollywood Boulevard. Ten other winners get each get ten DVDs of films by 2009 Oscar nominees or winners, and autographed copies of Roger Ebert's Movie Yearbook 2009. The 11 winners were selected in a drawing from the perfect entries. Snarking is cultural vandalism. I have arrived at this conclusion belatedly. I have been guilty of snarking, and of enjoying snarks. In the matter of snarking, I spake as a child, I understood as a child, I thought as a child. But it has grown entirely out of hand. It is time to put away childish things. I must restore my balance, view the world in a fair way, hope to inspire more appreciation than ridicule. No doubt there will always be a role for snarking, given the proper target and an appropriate venue, and I reserve the right to snark when it is deserved, as in certain movie reviews. But in general I must become more well-behaved. A snarker is one who snarks. The word is said to be a combination of snide and remark. There are slithering undertones of shark, bark, and stark. There is also, for me, an association with snipe. The practice involves holding someone up to ridicule not so much for anything they actually did, as for having the presumption to be who they are. The slumdog didn’t stop at winning a million, but zoomed straight on up to Oscar gold Sunday night: “Slumdog Millionaire,” perhaps the most literal rags-to-riches story ever told, swept the night, winning the Academy Award as the best picture of 2008, and seven more Oscars. Based on his show-stopping speech at Saturday night's Independent Spirit Awards, if Mickey Rourke wins an Oscar on Sunday night the Oscarcast is going to be a lollapalooza. As his comeback film "The Wrestler" won for best film, male actor and cinematography, Rourke brought the show to a halt and the audience to its feet with an acceptance speech that was classic Mickey. The Indie Spirits are telecast live and unbleeped, which added considerably to the speech's charm. Lisa, a friend of mine, was for many years Variety's correspondent in Paris. In the countdown before the Oscars, I found these observations fascinating. The only additional Oscar prediction I'm prepared to make this year is that Hugh Jackman will be a delightful host for the evening. Famous for playing Wolverine in the X-Men movies, he may not strike you as the life of the party, but I base my prediction on two factors: He's Australian, and he's the youngest of five. Therefore, he's funny, born and bred.